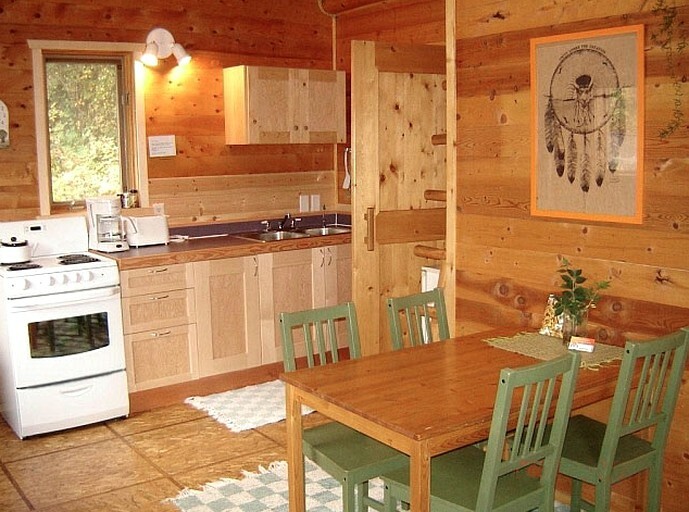 This glamping site offers two cozy cabins rentals at this glamping site in Canada. 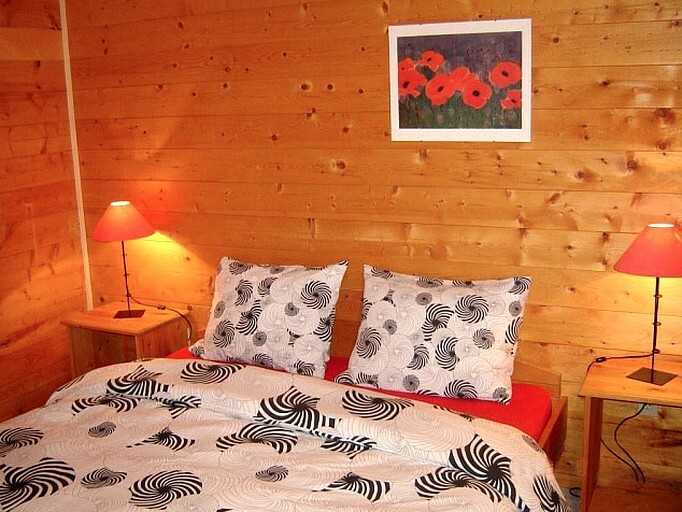 Each cabin has a bedroom with a queen-size bed and a loft with two single-size beds providing an ideal retreat for two adults or a family with two children. They both have a full kitchen with a refrigerator, an oven, and a microwave, as well as a dining area. 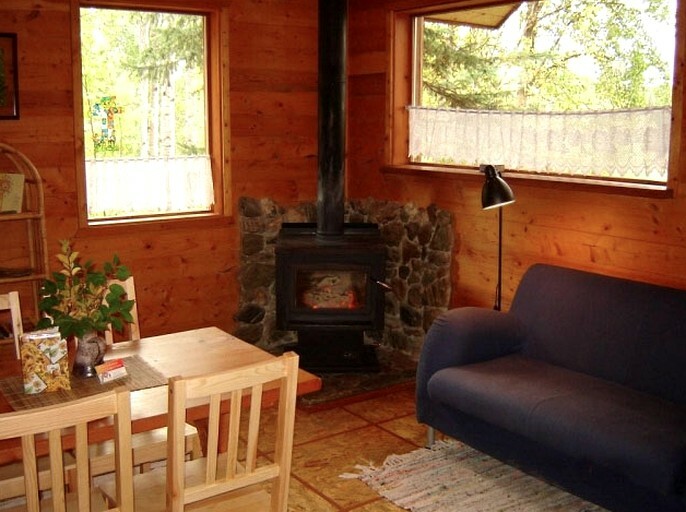 The cabin is kept cozy with an inviting wood-burning stove. 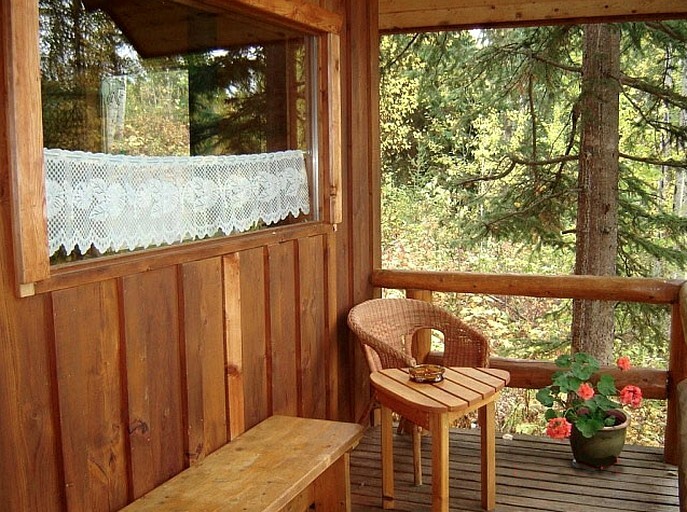 Guests will delight in soaking in the scenery from the furnished porch outside of their cabin. Encircled by rural wilderness, guests will enjoy a tranquil and peaceful atmosphere during their nature retreat. With access to mountains, rivers, and lakes, guests will be able to enjoy hiking, rafting, and more during their stay. The hosts will be glad to organize activities for guests upon request but still, guests should allow for opportunities to discover the area alone. The unique, relaxing atmosphere and the friendly people at the glamping site make this lodge feel like a home away from home. 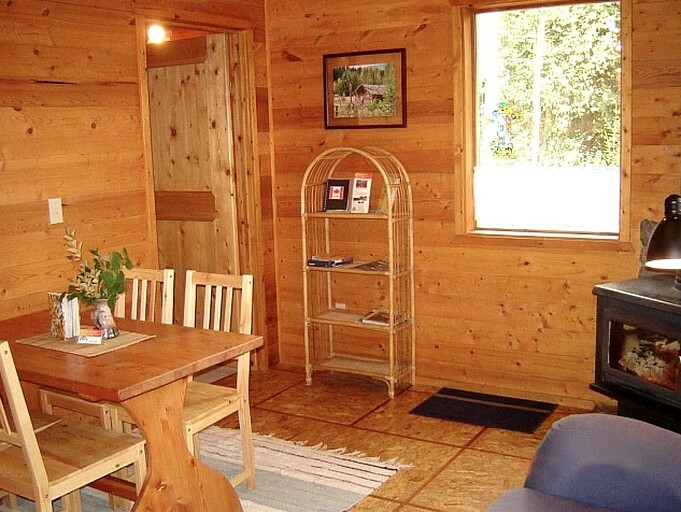 For an additional $15.00 per person, guests can enjoy breakfast in the main house of this glamping site. Children under two years of age eat for free, and children up to 11 can eat for half price. The Canadian wilderness is at the doorstep of this glamping site, allowing guests to enjoy a huge range of recreational activities throughout the year. 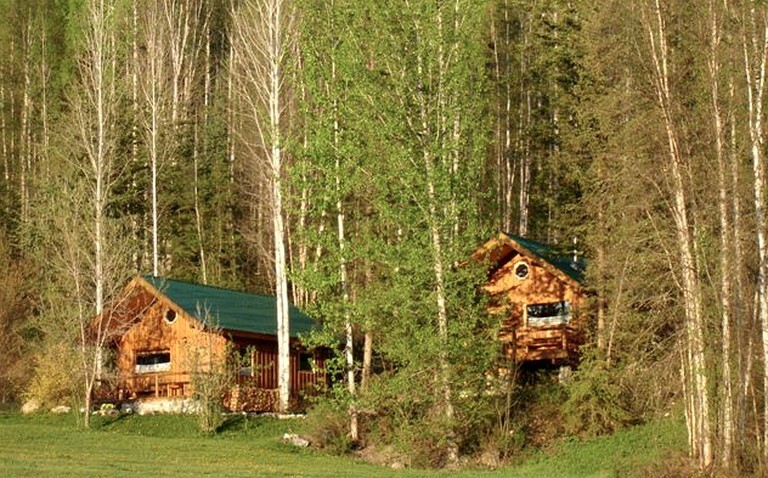 Guests may also like to visit some famous sites during their stay, such as Kicking Horse Mountain Resort, various hot springs, as well as a buffalo ranch and wolf wildlife center close by. During the summer, guests will be able to enjoy plenty of on-land activities including guided hikes, trekking, horseback riding, biking, and bird and wildlife watching. For those who prefer water sports, they can excite over canoeing, kayaking, river rafting, paragliding, fishing, and various float trips. A small network of trails spreads throughout the 64 hectares of land on the site, where guests stand a good chance of observing striking animals from black bears, elk, and moose, to birds, rodents, and even the occasional cougar. Nights can be spent sitting around a romantic campfire outside the lodge with the cry of the coyotes in the far distance. In nearby Golden, visitors can play golf on the 18 hole course available for guests or take a quiet stroll along the Kicking Horse River. 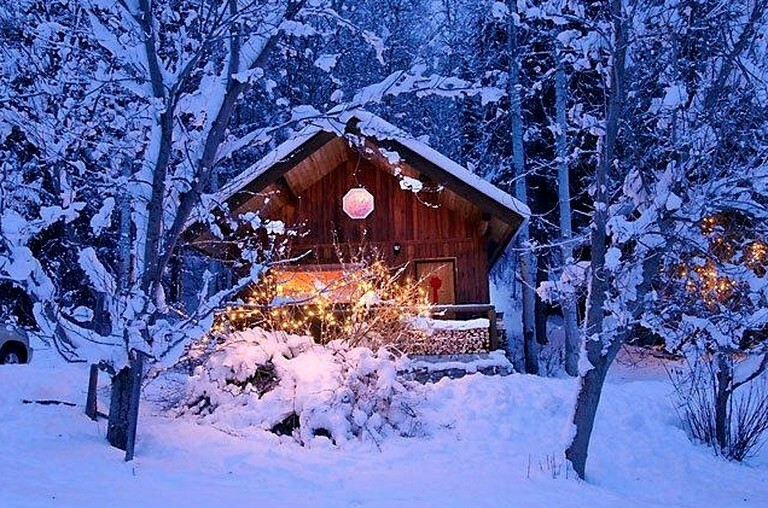 The deep winter brings with it a number of different activities such as cross-country skiing, guided snowshoe tours, alpine skiing, and snowboarding at nearby ski areas. Heli-skiing in the Purcell Mountains, dogsled tours, and ski tours are also available for guests upon arrival. A unique opportunity for photographing wolves in beautiful British Columbia is available and offers wolf and wildlife photography sessions year-round, or guests can just enjoy the company of these beautiful creatures in their natural habitats. 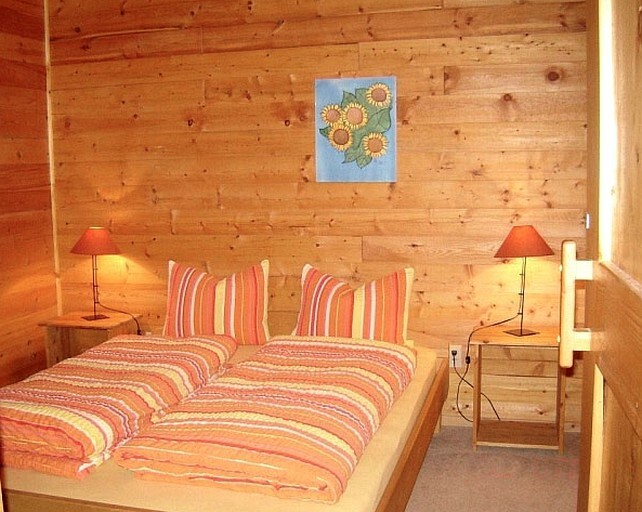 Rates listed are based on double occupancy, and peak season is from December 15 to March 30 and from June 16 to September 15. Low season is from September 16 to December 14 and from April 1 to June 15.